I am so proud of my daughter. We’ve been working diligently on her reading skills since Christmas, and I can’t believe the headway that we have made in just a few weeks. She has transformed from a frustrated little one to a girl who can read an easy reader with little help. I seriously would have never guessed at Christmas that she could have made this much progress. In retrospect, I think she needed more encouragement from me. When I began putting a heavy focus on reading and truly trying, she began truly trying, too. Between these Printable Reading Reward Stickers, a specified reading time, and a new Reading Program, she now reminds ME when it’s time to read! A special thanks to Reading Eggs for sponsoring today’s post and for offering a FREE 30 day trial of their Reading Eggs program. Kids love stickers, but sometimes I don’t have stickers handy. 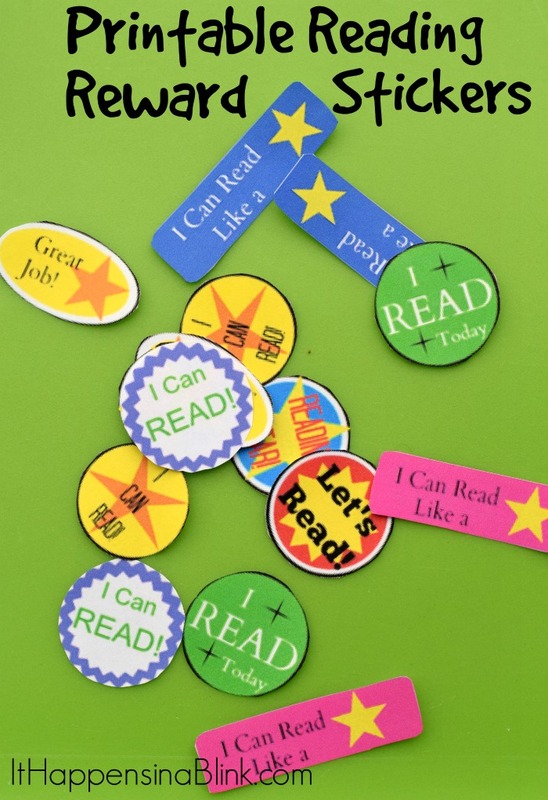 This week I pulled out a little gadget that I’ve been saving for a special project, and these Reading Reward stickers seemed like just the thing. I created these stickers in PicMonkey, but to save you some time, I’m uploading them here as a free download for you! 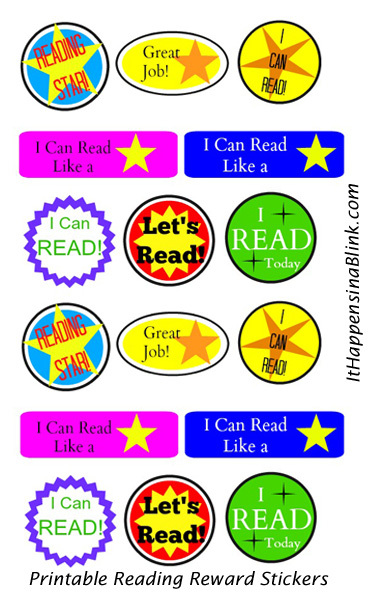 To make your own Printable Reading Reward Stickers, right click the below image to save it to your computer. Print out the image, and then cut out around the shapes. Using a Xyron Sticker Maker, follow the instructions to turn the paper cut outs into stickers. Use them as Reading Rewards for daily reading. If you’re efficient in PicMonkey, you can always make your own stickers and personalize them with your child’s name. My daughter may only be in preschool, but like other kids she knows her way around an iPad. For some reason, games and books always seem more enticing when they are on an electronic device. 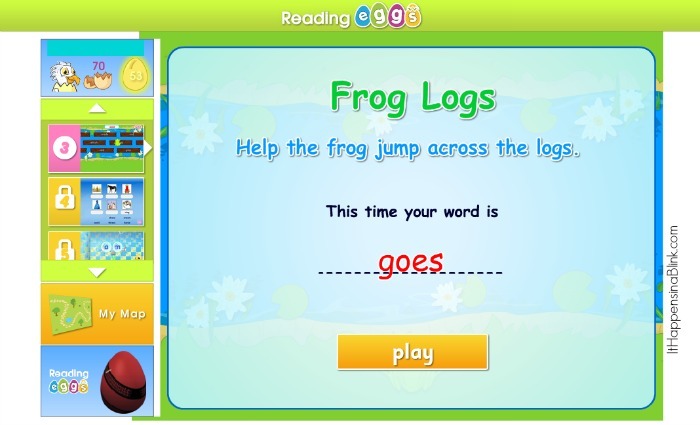 The Reading Eggs program is an educational collection of games and activities that not only promote reading, but actually help kids learn to read. When she asks for “technology time”, instead of playing some meaningless game, I sit with her and we go through a Reading Eggs lesson. Her absolute favorite activity is the Driving Test Centre. 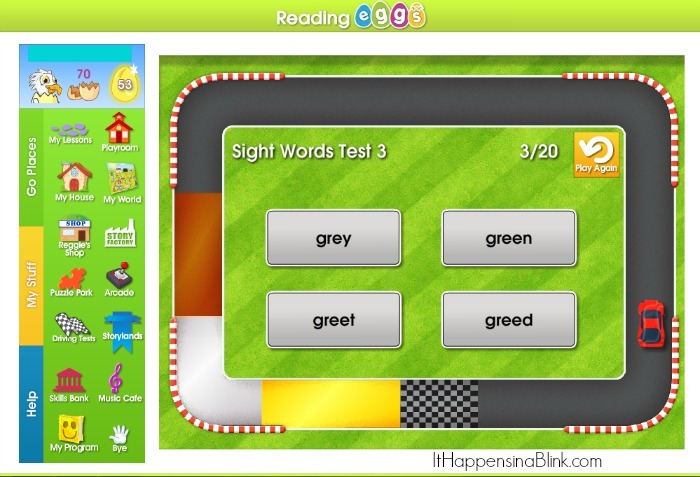 From a mother’s perspective, the neat thing about the racing game is that she has to complete a series of 20 questions (about sight words, content words, or sounds) before she can play the game. Reading Eggs has made a true effort to make their program something that kids want to do rather than something parents have to force their kids to do. Reading Eggs is more than just a website. They are a program with a complete selection of learning activities including My Lessons, My House, Skills Bank, Puzzle Park, Arcade, Reggie’s Store, Music Cafe, Storylands, Story Factory, My World, and the Driving Test Centre. I found the program to be helpful because the tests at the beginning of the program evaluated my daughter’s reading level. I had been worried that she was behind when it came to reading, but the Reading Eggs program evaluated her reading age at almost a whole year above her actual age. 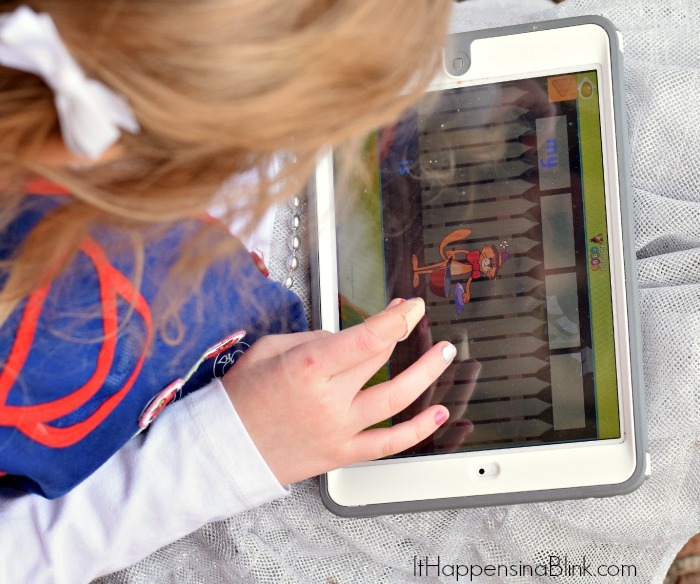 Reading Eggs can be played on a computer or a tablet. Parents can create a profile for each child that they have in the program, so it’s great for households with multiple kids who are working on their reading skills. I absolutely do not recommend products that I don’t believe in, but my daughter’s new found enthusiasm over reading makes me recommend the Reading Eggs program wholeheartedly. Want great news? 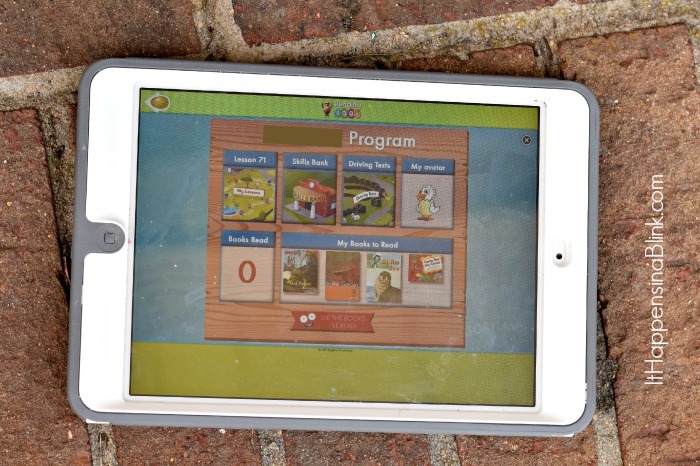 Reading Eggs wants every child to be able to try out their program. 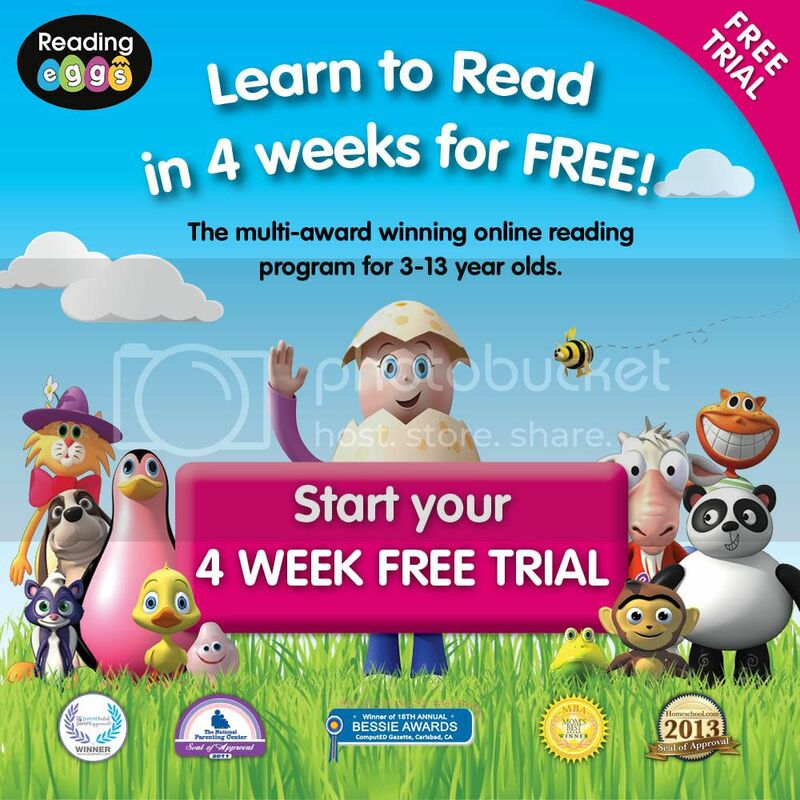 They are offering 4 weeks of the Reading Eggs program for FREE! Simply click the image below to head over to the website to sign up for the free 4 week trial! This is a sponsored post written by me on behalf of Reading Eggs. My daughter did reading eggs last year, she loved and it helped her catch up and quickly advance through the DRA reading levels. Watching your child learn to read is amazing! I absolutely LOVE your reading reward stickers! 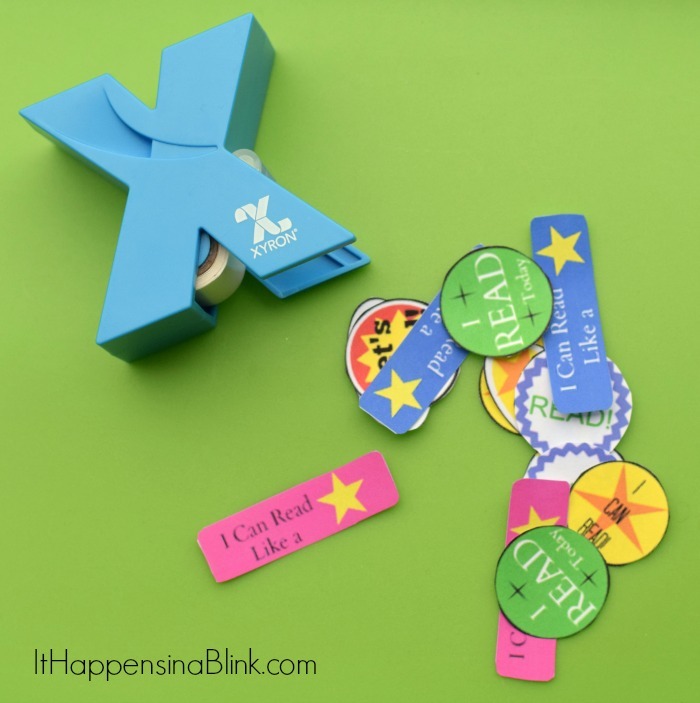 Kids love stickers, so these reading reward stickers are awesome! Great program! We did it when LC was learning to read. Looks like a great program! Going to share this with my brother – he’d love it for my neice! Positive reinforcement is the way to go with teaching reading! Love this! This is wonderful! I’m so excited she is doing so well and that things turned around for her with this fun program. I’ll have to take a look at it. We are always looking for new ways to help kids read at our center. Thanks for the great tips! Reading Eggs is a great program. I love these stickers. My son needs a lot of motivation! What a grand idea! I’m sure the kids just LOVE this idea! Looks like a great idea to get the kids excited! very cool!! I’m always looking for ways to inspire my son to practice his reading. Excited to try my free trial. thanks for sharing this! Such a great way to give positive reinforcement! these are so cute! It is so important to find small ways to reward them for their hard work. Those are really cute! And a great way to encourage reading if that’s needed. Awesome positive reinforcement. I’ll try this when my son grows older. I NEED these right now! We are working on reading with my 6-year-old!